A sense of fear and unease has taken hold on dairy farms in Vermont and across the Northeast in the wake of enforcement actions last week that led to the deportation of nearly 700 unauthorized immigrants nationwide. Though no farms in Vermont or nearby states were raided, those who work in the dairy industry say President Donald Trump’s recent executive orders on immigration have left them scrambling to both protect their workers and come up with alternatives if the crackdown extends to the agricultural sector. “People are extremely nervous — farm owners and farmworkers alike,” said Dave Chappelle, a consultant on labor and management in the dairy industry in Vermont, New York and New Hampshire. Trump, however, has pledged to deport millions more and in an executive order signed last month laid out the parameters of a far-reaching policy on border security and immigration enforcement. The order calls for the hiring of 5,000 additional border patrol agents and the removal of “those individuals whose legal claims to remain in the United States have been lawfully rejected.” It also calls for the construction of a wall along the U.S.-Mexico border. State Rep. Peter Conlon, D-Cornwall, who used to work with a consulting company that places workers on dairy farms, said the Obama administration tended to focus on deporting immigrants who had just entered the country or who had more serious criminal records. According to Conlon and immigrant advocacy groups, the Trump executive order lowers the bar dramatically. And even though the state of Vermont is discussing legislation, S.79, aimed at limiting cooperation between local law enforcement and federal immigration officials, Conlon said U.S. Customs and Border Protection and U.S. Immigration and Customs Enforcement (ICE) have virtual carte blanche when it comes to enforcing immigration law. “ICE is surprisingly powerful,” Conlon said. Though Vermont farms have not seen any immediate impacts from the executive order, the sense that things could change at any moment is contributing to fear and uncertainty. “If something does change it’s going to be quick,” said Tebbetts. Last week, as unauthorized immigrants were rounded up across the country, Chappelle said rumors of an enforcement action on a farm in New York state began to circulate in Vermont. Chappelle said workers on a farm in southern Vermont told him they’d heard about a raid three to four hours away in New York. Chappelle was unable to confirm whether it was anything more than a rumor but said it attests to the fact that farmworkers are on edge. F. Brandon Mallory is the CEO of Agri-Placement Services, a company that helps dairy farmers find workers, mostly from Mexico and Central America. He said he’s never seen workers and farmers so rattled. Mallory also heard about the rumor of a raid in New York state last week but said that in practical terms little has changed. Mallory works with farms throughout New England, the Midwest and as far south as North Carolina. He said the Trump executive order on border security and immigration, along with the president’s campaign rhetoric that often vilified Mexicans, has had a chilling effect on farms that rely on immigrant labor. “Everyone is really scared,” Mallory said. “Workers don’t want to leave the farm. And farmers are wringing their hands wondering if they’re going to lose their workers. Since the mid- to late 1990s the number of immigrant workers employed on Vermont dairy farms has steadily increased. As the domestic workforce became less interested in agricultural labor, small and large farms turned to agencies like Agri-Placement Services to help fill the gap. Today there are about 1,000 Latino farmworkers in the state, according to data compiled by the Vermont Migration Education Program at the University of Vermont. More than half those workers are employed on about 177 of Vermont’s 818 dairy farms. Mallory said workers who have been placed on Vermont farms through his company are responsible for milking 9,500 cows. In 2005 or 2006, John Roberts, who ran an organic dairy farm in Cornwall, hired two Mexican workers through Agri-Placement Services. He and his wife had purchased the farm in 1977 and in the late 1990s expanded, putting an addition on their barn, installing a new milking parlor and nearly doubling the size of their herd. They needed to hire more employees but were finding it increasingly difficult to attract local workers. By the early 1990s, said Rep. Conlon, the labor shortage had become a crisis for the New England dairy industry. Small farms were struggling to find a stable workforce, and word traveled informally through the immigrant community. “Immigrant workers started making their way north and frankly saved the dairy industry from what was a severe labor shortage,” Conlon said. Traditionally dairy farms have not qualified for temporary visa programs that allow workers to come to the U.S. to perform seasonal labor such as picking apples or slaughtering turkeys. Dairy farming is essentially year-round work, and immigrants who work and live on dairy farms will often stay in the country for three to five years, whether they have the proper paperwork or not. Raids on dairy farms in Vermont are not unheard of. In the mid 2000s, Roberts recalled, border agents showed up at a neighboring farm that employed about a dozen immigrant workers who milked 1,000 cows. According to Roberts this farmer was suddenly left with no employees. “He struggled, and then a bunch more Mexicans showed up,” Roberts said. 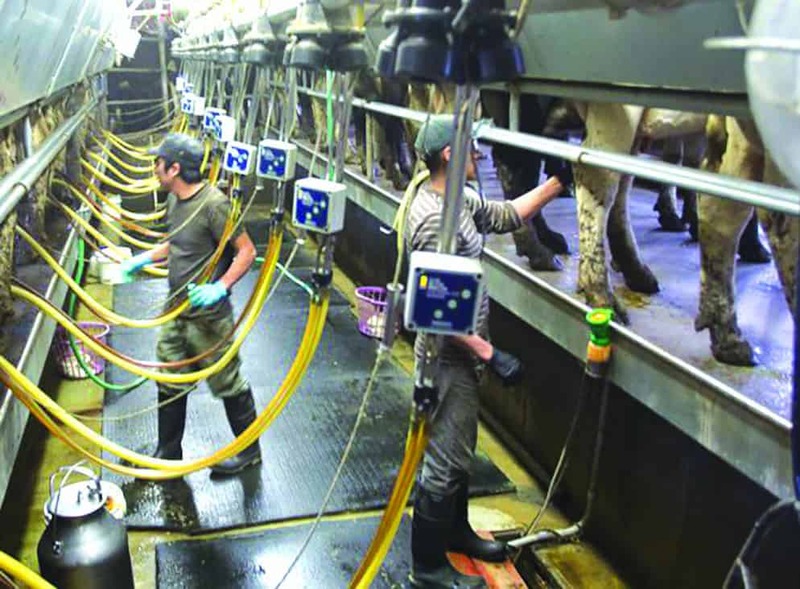 In the dairy and agricultural industries immigrant laborers are known for their work ethic—on average putting in 60 to 70 hours a week—and can earn up to $40,000 a year. Over time they’ve become an integral part of the dairy industry. Still, efforts to develop a guest worker program that would assist the dairy industry have floundered under both Democratic and Republican administrations, Mallory said. In a crisis, perhaps prison labor? Though Vermont has plenty of dairy farms that do not rely on immigrant labor, the state has begun to discuss emergency measures it would take if farms are subject to enforcement action or if immigrant workers begin to leave voluntarily out of fear of a crackdown. The Agency of Agriculture, Food and Markets and the Department of Corrections have been discussing the possibility of using the prison work relief program as a short-term solution. A longer-term vocational training program for inmates has also been floated. In addition the Agriculture Agency is exploring whether dairy farms could qualify for seasonal H-2A visas. Under that program workers are available only for 10 months out of the year, so farmers would have to manage for the remaining eight weeks without immigrant labor. They’d also be subject to greater federal oversight and would have to comply with the Fair Labor Standards Act and the Migrant and Seasonal Agricultural Worker Protection Act. Moreover, it remains unclear if dairy farms would even be eligible for the program. According to Berry, Leahy’s legislative aide, during the Obama administration the senator approached the secretary of labor and made a case for why the H-2A program should be open to the dairy industry. Berry said he got a fairly firm rejection from Obama. Joe Tisbert, president of the Vermont Farm Bureau, said the industry is pushing for immigration reform that supports strong borders and allows dairy and agricultural farmers to get the help they need. According to Tisbert the need for qualified workers has increased dramatically over the last five years. For many farms in the state immigrant workers have become part of the fabric of what they do. Roberts recalled that when he sold his herd of about 190 purebred Brown Swiss cows in 2012, one of his longtime Mexican employees wept. (Roberts sold his farm last year). “He liked working for us,” Roberts said. Mexican workers milk cows in the milking parlor of a Vermont dairy farm.